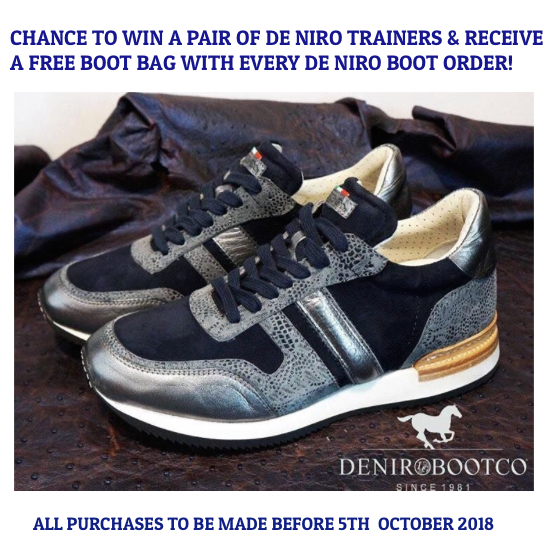 FREE De Niro Boot Bag & Chance to Win De Niro Trainers until 5th October! With every De Niro Boot purchase, you will receive a free boot and the chance to win a pair of custom De Niro Trainers! Every order placed before 5th October will be entitled to this offer. This includes all the boots from the De Niro Boot range. The De Niro trainers are able to be designed with all the leathers from the De Niro range and can be designed all by you! Make sure to get your orders in before 5th October to be in with a chance to win this brilliant prize! We only require a deposit on all boots when ordering too.